I’m a huge fan of Asian food and southeast Asia is the food region I love most. For this dish I will focus on Thailand, a country I hope to visit someday soon. Thai food is full of flavor and spice and Green Curry won’t disappoint the taste buds. Once you eat this you’ll notice a variety of sensations, aroma, heat, velvety texture and some crunch so long as you don’t overcook the vegetables. Now that you’re all warmed up lets get to work. Serve over rice. This recipe will makes enough for 4 or 5 people. Cook rice while you’re preparing the curry. Heat the oil in a wok over medium high heat and add the curry paste, stirring constantly. Cook for a minute or two then add 1/2 can of coconut milk and stir until well mixed. After another minute add the remaining coconut milk and stir until it comes to a bubble. Next, add the chicken and continue to stir for another 5 minutes. Now stir in the chicken broth and bring back until bubbling. Now add the vegetables (hold back soft vegetables like squash until later in the cooking process or you will overcook them) and continue to stir until the vegetables and chicken are cooked through. 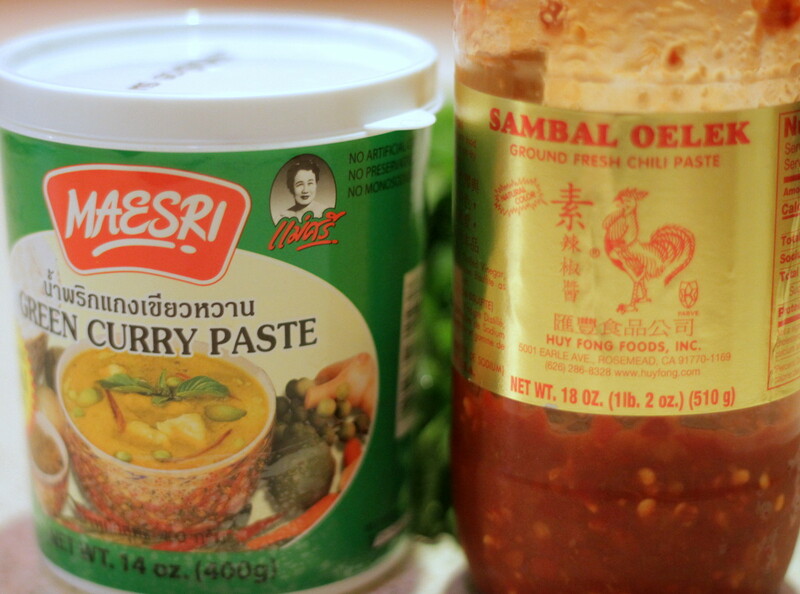 Maesri is the brand curry paste I use and can be purchased at most Asian markets. Use another brand if you can't find this one. Place a generous portion of rice in a bowl and spoon the delicious curry over the top. Garnish with cilantro leaves and add a little sambal if you like it even spicier. Lastly, this is the way I made my green curry, next time who knows, maybe I’ll make it with beef or shrimp or different vegetables. It’s you’re meal, make it how you’d like it. Experimentation is the key to discover what you really like. Enjoy! If this dish pleases you in any way I’d like to know, send me a note. If you REALLY like it let me know by clicking the donate link at the bottom of this page. Your contribution helps my family advance Bible translation around the world with Wycliffe Associates. God Bless! 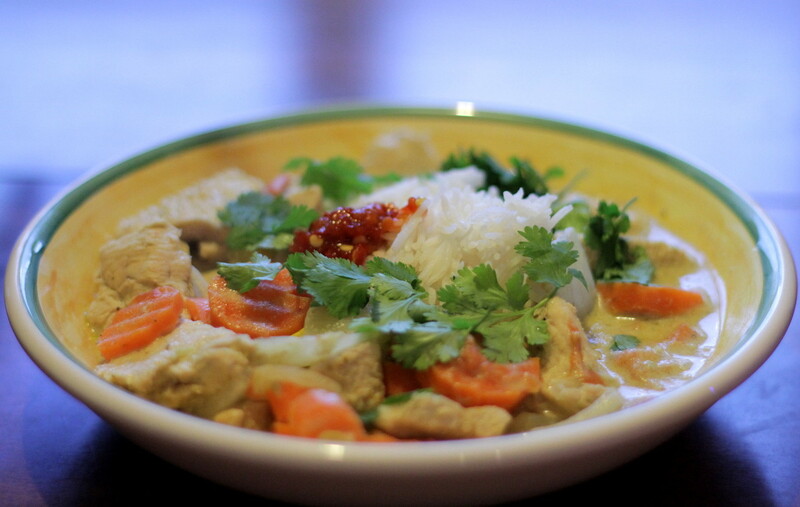 Just made the green curry dish tonight… WOW!!! That recipie rocks! Nice and light at first with a good bite and then it starts to build. We were all sweating by the end of dinner. We will use this one again. Will you be one of the many to help fund Bible translation by making a TAX DEDUCTABLE gift of $10, $25, $50, $100 or more? Your gift to Wycliffe Associates will see that every tongue still without a Bible in their “heart” language will have one in their lifetime. The Time is Now to make VISION 2025 a reality!